I just realised that for someone who loves Raj Kapoor and his movies, I have not reviewed a single one of his movies so far. Several Raj Kapoor movies fall into my 'favourite movies of all time' list. Barsaat, Shree 420, Mera Naam Joker (part 1 and 2, not part 3), Awara, Aag (which I like for its sensibility, and the shift away from the heavy theatricals of an earlier age), Jis Desh Mein Ganga Behti Hain... Several more I like for his acting, even though he was not known as a 'great' actor - Jagte Raho, Anari, Teesri Kasam, Sharda, Phir Subah Hogi, Kal Aaj aur Kal, and above all, the frothy heroine-centric Chori Chori. Since his death anniversary was on June 2nd, it seemed as good a time as any to rectify the error. Let me begin my ode to RK with Chori Chori. Even people who usually do not like Raj Kapoor, like this very faithful adaptation of Frank Capra's It Happened One Night. Director Anant Thakur and writer Aga Jani Kashmiri gave it the bite that localised the final product without weakening the original's charm. One of the first 'road' movies in Hindi cinema, it exploited Raj Kapoor's talent for comedy, and he had an able accomplice in Nargis. Kammo (Nargis) is the spoilt daughter of businessman Giridharilal (a wonderful, wonderful Gope). When we first meet her, she is busy throwing plates at the uniformed bearer who takes her food into the cabin. Then she throws a tantrum at her father. When her father refuses her demand (she wants to marry Suman whom her father deems a fortune hunter), she throws herself off the ship, and swims to the shore to the tuneful accompaniment of fisherfolk's song. Can't say she is not enterprising. She manages not only to escape, but our intrepid heroine pawns her diamond ring and buys clothes and accessories (a nifty pair of sunglasses) and sets off to Bangalore where her true love awaits her. Only, she has no clue how to go about it. Kammo runs into Sagar (Raj Kapoor), a reporter, and their first meeting is not very propitious. Their subsequent interaction does nothing to improve their impression of each other. The bus journey from Madras to Bangalore begins with a spat over a seat. They continue bickering until night falls, when she unwittingly uses his shoulder to sleep on. When she apologises, he graciously forgives her - Bahut si raatein bekaar gayi, ek aur sahi... but the uneasy peace doesn't last long. When they make a pit stop, Kammo insouciantly tells the conductor to wait for her. When, after a song-and-dance through the fields, she takes her own sweet time to come back, she is indignant to find that the conductor did not obey her command. Sagar has since found out that she is an heiress, but is not impressed. Giridharilal is not Kammo's father for nothing. He has promptly advertised her disappearance and offered a reward of sawa lakh (Rs1.25 lakh) for news of her whereabouts. We are also introduced to Suman (Pran); he is all that her father fears him to be, and more. In the meanwhile, Sagar and Kammo have taken the next available bus to Bangalore. She is importuned by a would-be-poet much to Sagar's amusement. However, his chivalrous instincts (and a well-placed heel to the shin) cause him to rescue her by claiming she is his wife. Her thanks are begrudging, and he claims he rescued not her, but the unfortunate poet. However, when the poet wants to claim the reward, Sagar takes on another persona - Sultana daku, a dacoit who has the blood of three other poets on his hands. When the bus breaks down, Sagar and Kammo are forced to take refuge in a nearby-inn; since the innkeeper only lets rooms out to married couples, they perforce continue the farce. Sagar even resorts to unique ways to prove he has no ulterior motives in sharing a room. All he wants is an exclusive story that will make him famous. But he still tries to warn her off Suman, much to her chagrin. Arguments and snarky remarks fly back and forth, neither willing to give a quarter. Their masquerade leads to some comic interludes when people, on trail of the reward, come looking to see if they are really man and wife. But a fledgling attraction is growing, one that Sagar at least, is beginning to be aware of, though he is quick to nip it in the bud. Their bickering continues, even as their mutual attraction simmers unfettered. Kammo is very close to her destination, but her steps falter. Sagar is too cynical to be of any help, and their bickering continue as they vend their way, one reluctant, the other just wanting to get the journey over with. But soon, it is is time to part, and she is thinking less about her meeting with Suman and more about her parting with her rescuer. When she wonders whether Sagar will miss her, 'Sorrow is a weakness', he counters, and he prefers not to exhibit his. When Kammo leaves, in tears, Sagar is forced to confront his own feelings. Yet, the morning finds Sagar absconding, Kammo abandoned, accused of immorality, and thrown out of the inn where they spent the night. Is Sagar truly absconding? Why did he leave? What will Kammo do now? Does she go to Suman, or back to her father? And Suman? Will he give up his golden ticket? If Sagar truly loved Kammo, why is he asking Seth Giridharilal for money? The film belonged to Nargis. It is Kammo who is the lead character. It is she who drives the story forward, and it is her reactions that set off the entire chain of events. Sagar only provides the foil, and Raj Kapoor is content that it is so. It is precisely because he is restrained that Nargis is free to take flight, and soar she does. Effortlessly. She plays the ditzy blonde stereotype with class, not allowing it to descend into caricature even once. She is entitled, but clueless rather than snobbish, protected from the realities of life by her father's wealth. She is no pushover, and gives as good as she gets. She is also an unusual heroine in that she takes the steps necessary to get what she wants. She is the one who is setting off to find Suman, it is she who, when she realises that what she feels for Sagar transcends what she felt for Suman, tells Sagar that she loves him. Watch her in that one scene at the end where her father tells her that he has fixed her marriage to Suman. Shock, horror, and grief, all flit across her face. Sagar is a snappy, sarcastic, hard-nosed reporter, who is willing to help the spoilt brat of an heiress in return for an exclusive. And Raj Kapoor is all that, and more. When he falls in love with her, almost against his will, one can see him trying to brush it off. When she tells him she loves him, he is conflicted - he wants to believe her, but is not sure he can. When she leaves, as he thinks, the hurt is hidden behind a demand to be paid an itemised bill. And yet, there is no melodrama; no accusations hurled at each other: just a request that he be paid for his trouble on one side, and a demand that he be recompensed and sent away, on the other. The real-life involvement of the leads lends a certain piquancy to the romance on screen. And yet, this was the last film they would do together. Once Chori Chori was complete, Nargis left the RK fold, never to return (except for a cameo in Jagte Raho). In fact, Aaja sanam madhur chaandni mein hum was shot without the leads talking to each other. Yet, the song sequence crackled with tension on screen - they are just beginning to realise (on-screen) that they are attracted to each other; but one is running away to marry someone else, and the other was helping her do so. They weren't wholly acting; when Nargis is emoting to Chaand ki pehli nazar keh rahi hain pyaar kar zindagi hai ik safar kaun jaane kal kidhar, she looked like she really meant every word of it. Pran, as Suman, was all that a gold digger should be - handsome, charming, and scheming. One can almost understand why Kammo would run away to marry someone like him.While Bhagwan, Mukri, Rajasulochana and Johnny Walker managed to work the side plots without making them too irritating. And the music. Oh, the music. Shankar-Jaikishen must surely count this as one of their best overall scores. The picturisations, particularly of Jahan mein jaati hoon, also lend credit to the rumour that surely RK must have shot them himself. (Though that is probably unfair to the director; RK had a well-deserved reputation for not being a director on the sets, unlike his contemporaries.) Keeping in character with the overall flow of the movie, the female voice overrides the male. Raj, in fact, does not even get a solo; he only appears in the three romantic duets. Manna Dey gets to sing playback for RK, leaving Rafi to sing All line clear for Johnny Walker, and Sawa lakh ki lottery for Bhagwan. Lata Mangeshkar rules supreme over the female vocals, lending voice to both heroine and others. And because it was an AVM production, we were also treated to two excellent classical dances by Kamala Laxman, and by Sai-Subbulaxmi. Bliss. This was a film that just 'came together' for want of a better phrase. Script, dialogue, music, acting, direction, even the comic side plots, usually the bane of most films, just fell into place to form a whole that was greater than the sum of its (excellent) parts. 2) Great story & performances. Most people will agree with #1 and grudgingly agree with #2, but would say that since it was adapted from the Hollywood classic IHON, at least the credit for a great story has to be significantly diluted. a) Chori Chori (IMHO) is better than a Dev Anand movie :"Nau Do Gyarah" that has a similar story (at least in the beginning). Both had great songs, but when NDG veers off from the basic story, I think it looses some of it charm. As a side note, both Dev Anand & Raj Kapoor copy Clark Gable's hairstyle (slightly ruffled windswept) style in their respective movies. b) The more controversial reason, I believe Chori Chori is a shade better movie than IHON. A story containing a rich heiress running away and meeting a common reporter certainly fit the bill in the depression era USA of the 30's, but would not be such a great fit in later decades. 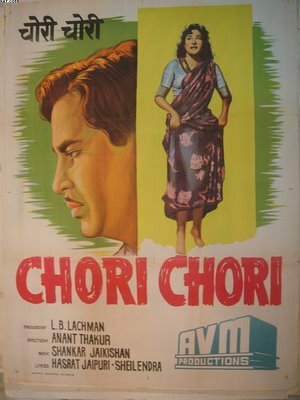 Chori Chori, on the other hand, fits like glove in the Indian context; and would still be a relatively fresh movie. Thanks for a wonderful review, and refreshing memories of great songs. Solva Saal is also kinda like It Happened One Night, right? Which one is more light-hearted? Cos I've seen Solva Saal and it was a whole lot of fun. RK's character is more of a cynic, Dev's is more playful. And I asked you about RK and Nargis! Do you think it's true? I enjoyed the post, heehee, but my computer was acting up, so I couldn't get the darned first comment. Oh, well. is better than a Dev Anand movie :"Nau Do Gyarah"
Glad you like it, Samir. And I agree with *both* your points. This is a film that has remained 'fresh' through the ages. As you so rightly pointed out, it can still be adapted today (God forbid, though!). I too, would put Chori Chori above Nau Do Gyarah even though the latter had my other favourite, Dev, in it. For one, I think Nargis was a far better actress and had better screen presence than Kalpana Kartik ever was, or did. Secondly, the chemistry between the leads was so much more electrifying in Chori Chori . You're perfectly welcome to review it, Sasha, I haven't called dibs on the film. :) Besides, the way we look at the film differently anyway, so go for it. Solva Saal was somewhat like Chori Chori, yes. I liked both, honestly. Because the Dev-Waheeda chemistry was as good. That said, Chori Chori came a couple of years earlier. Yeah, I guess I should go get that DVD! :D I really want to see how it is like, probably one of RK's best movies! I like the songs in both movies! Awesome, awesome, awesome. helping her do so. They weren't wholly acting; when Nargis is emoting to Chaand ki pehli nazar keh rahi hain pyaar kar zindagi hai ik safar kaun jaane kal kidhar, she looked like she really meant every word of it. Sorry! (Not very.) C'mon, kid. You *are* going to have people disagree with you, you know. And let's be honest, I *love* Dev, but he was hardly a thespian. Even he never claimed to be one. *threateningly* If you don't stop flooding my blog, I'll ban you from it, so there! One of the worst ways to kill yourself - a gut wound is not a very pretty way to die. Very entertaining, lovely songs, what does one need more? I just shudder at the thought that Mukesh nearly sang the Raj songs instead of Manna Dey. The producers insisted on Mukesh, but Raj put his foot down and afterwards everybody was impressed with the result. I think Mukesh was not available at that time because of his acting stint! There is somewhere a version of aa jaa sanam or yeh raat bheegi bheegi with Geeta Dutt and, I think, Hemant Kumar and that version is lovely too. It was available on you tube 4-5 years back, then it disappeared. I should have checked before I posted the last comment. I remembered it somehow a bit different. Or better still, Vyjayanthimala should have shot both of them for being total idjits. Mukesh had disappeared to try his luck as hero. I'm glad too that Manna Dey got this opportunity- what lovely duets! Was the Geeta-Hemant Kumar duet from Chori Chori too? Bhushan, who? And where is the link? Now *I* should have checked before I posted my earlier comment. :) This is a very interesting find. I didn't even know there was such a version. I wonder why they didn't keep it; I mean, why they re-recorded it with Lata and Manna Dey. NOOOOOOOO! NOT RAJENDRA AND RAJ!!!! LOL They do! I like to read the passages but I hate to write the answers. But I like to write essays cos then I can make all sorts of references in there and no one will know. 1) First I agree (reluctantly) that Raj Kapoor is a slightly better actor & much better director than Dev Anand, but Dilip Kumar is by far the best actor of the three. 2) Chori Chori is a great film, and Raj Kapoor & Nargis deserve the lion's share of credit. 3) I listened to the Geeta Dutt & Bhushan version (thanks Harvey), but I prefer the regular one with Lata & Manna Dey. Samir, LOL at the reluctant nod to RK as a better actor ('slightly'). :) And yes, I did mean to add that, in my opinion, Dilip was the best actor of the troika. RK was the best director, while Dev was... Dev. Much loved, and eminently watchable. But why'd you want to have Raj shot?! And I'll flay anyone who tries to shoot Rajendra! Mmm. My favourite Raj Kapoor film (probably because it's not a typically RK film? ;-)) I love the romance here, the story, and of course the fantastic music. And, that ending - the bit about his "demand to be paid an itemised bill". So Yes. You know by now I'm not an RK fan, Anu, but this one I love. So much that it's the only RK film I've bought a VCD of. By the way, Shammi acted in a very similar movie sometime later - Basant, with Nutan. Big resemblance in the story of the runaway heiress who meets up with a man whom she falls in love with. That played out differently, though, and got very convoluted in the second half. By references I mean, naming the characters in the story names that Dev used, dresing them up like he did, and doing the kinda stuff he'd do! (But no Noddy!) There was this time there was an essay about brother and sister, blah, blah, and I got it into my head that I should use the names Prashant and Janice. >___>"
Madhu, I was going to say *grrrrr* but then I realised that I come to your blog and say I can't stand Asha Parekh. :) Chalo maaf kiya. I'll start reviewing RK movies that you absolutely should have. Truly, there were many such. I haven't seen Basant. That's the one with Chori chori ik ishaara ho gaya hai, right? So many of these films seem to have been 'adapted' from It happened One Night or even from Chori Chori itself. Raj sings awesome songs. Rajendra gets an awesome song. Don't shoot them now? Now after reading your review I feel like watching again. The music - Oh the music, is exactly my reaction too. Haven't watched the film but I can think of a modern version to this tale - "Dil Hain Ke Maanta Nahin," of course! Cute little movie, I thought. And from your description of "Chori Chori," a scene-by-scene remake it is, I suppose. Pacifist, welcome!! I was beginning to feel a bit outnumbered on my own blog. :)) Isn't this film eminently re-watchable?? Perfect rainy day movie-watching experience. DHKMM is a remake of Chori Chori, Lakshmi. Only, while I like Aamir, he played 'Sagar' (Arun Jaitley) a bit more over-the-top than RK did. I much prefer RK's Sagar. Both of them only in Sangam, cross my heart. Well, Rajendra Kumar, along with Raaj Kumar in Dil Apna aur Preet Parayi also. C'mon, you can't begrudge me one teeny tiny shot? Why they rerecorded it with Lata and Manna Dey is anybody's guess! Somehow the version which I have posted has this artifical echo sound to it and thus doesn't please my ears much as well. The versionw hen I first heardit didn't have this effect and it sounded much much better. i wouldn't say it was better than Lata-Manna, but it was good. To be honest, and with all due respect to Geeta Dutt whose voice I love, I *much* prefer the Lata-Manna Dey version. The Geeta Dutt version is interesting to me only as a rarity - I didn't know it existed. No. I don't. :) I find her extremely annoying in her 'girlish' roles. Among her contemporaries, I much preferred Sadhana. Nutan, Waheeda, Meena Kumari were a class apart, of course - no comparisons at all. I remember the music of the film more than the story itself. Although it is meant to be romantic, I always find strains of sadness in the songs. Melancholia describes it best. Yeh raat bhigi bhigi must be the saddest song of Indian films - maybe only in my head! I do not know that I would qualify Ye raat bheegi bheegi as the 'saddest' song, but you are right about the strain of melancholy that runs through it. The tighter editing could have ceratinly made this movie even better. This must be the only movie where none of Raj Kapoor's songs have been playedback by Mukesh! Not that any one would complain. In fact, Mukesh's takover of RK , after such a colossus success, must remain one of the classic intrigues of film industry. I don't think Mukesh 'took over' after this film - Chori Chori was the exception to the rule. Mukesh had been RK's voice ever since Barsaat, but he was away trying to be an actor, and this was not an RK film. I love Jahan mein jaati hoon but my favourite duet is Yeh raat bheegi bheegi. And yes, it is sad that Manna Dey did not continue - he always did get a raw deal, I think. "And because it was an AVM production, we were also treated to two excellent classical dances by Kamala Laxman, and by Sai-Subbulaxmi. Bliss." Yes, those were bliss! That could be Kamala's best dance in a Hindi film. And it's one of the best from Sai-Subbulaxmi. I like how these great dances just came out of nowhere (I guess they are just item numbers, right?) But they are fantastic. Richard, Chori Chori is not my favourite RK movie either. :) But it is a great film to watch when you want romance and good cheer. The songs and dances - well, I would definitely say that Kamala Laxman's dance could be considered an 'item dance' :) but they did it very intelligently. That was our first view of Pran, and to show him at a dance performance was sheer genius, I think. What I liked even more was that there was no 'song' - it was just a thillana. The Sai-Subbulaxmi song, is very apt, actually; Indian weddings, especially South Indian weddings are known to have concerts or dance performances by well-known artistes. I didn't know that RK and Nargis were friends with the Travancore sisters way before Padmini became an RK actress. Interesting. Thanks for that bit of trivia. Heh. I watch this again, and think Aamir was also over-the-top. He was definitely a lot more flamboyant than RK, though I suppose it was a sign of the times. :) Thanks for visiting. I will. Thanks for the link. I am not really a RK fan but I liked this one. We never got to see RK like this again, I feel. Nargis was great, as ever. But I did like the remake too, though Pooja Bhatt was not a patch on Nargis. Amir Khan was good though. A really good entertainer and it's a great pity we don't get movies like that any more. I agree that this was one of his best. PB was not a patch on Nargis, and much as I really like Aamir, I thought he was over the top in DHKMN. In general RK came across as pretentious and totally uni-dimensional, you know, the poor (not so) little guy with the heart of gold. Boring. Go away! :( I know I should not be chasing my readers away like this, but to come on my blog and not like RK? Aaaargh! I quite understand. I guess I'd react the same way to someone who didn't like, say Gurudutt or Dev Anand. But you needn't worry. As long as you keep talking about old hindi/malayalam cinema, I won't get chased away. *Grin*. I'm quite used to most people not sharing my love for RK. S'okay. I like him, and that is not dependent on who else does. I love Dev Anand uconditionally, but my relationship with Guru Dutt is a bit more complicated. I think he is a brilliant filmmaker and a competent actor, but I hate the misogyny that underlines his films. His women are slotted into very, very traditional roles. Re: Gurudutt, yes I am a big fan. Actually I don't think of him as an actor at all. He's just a brilliant filmmaker and I go for his photography. Also the fabulous songs and picturisation. Of course you do end up feeling depressed and generally I prefer the feel-good films. Photography? VK Murthy. :) Agree with you about the fabulous songs and picturisations - he certainly had an eye. Too right, V K Murthy. But others did not use him in just that way. Anyway I guess we must agree to disagree on this. Actually, I don't think we are disagreeing. Are we? I think Guru Dutt is a brilliant filmmaker, and apart from my distaste for his attitude to women, I have usually spent my time in awe of his camera angles, his innate sense of song picturisation, and indeed, his ear for music. Not disagreeing really. Just slightly differing view points. I feel that he was a director for whom the technicalities of film making was of paramount interest. It is the *first* colorised version of an Indian B/W film that I LIKED. Aaargh. I wish they would spend less time colouring it and more in restoring it to its pristing B&W glory. There is a beauty to black and white that should be respected. Give me the full film, without scratches, and with digital sound, and keep it to its original roots - I'll die happy.